Most posts about tires and inflation warn about the problems of inflation being too low but I had a question about high pressure and felt it did deserve a few lines. 35 psi might be high or way low, depending on the type tire just as 150psi can also be too low or too high again depending on the type tire and application. The bottom line is that each "type" tire and application has an inflation that we would consider the target. Most of the target inflation are given when the tire is "cold" which means at ambient temperature and not warmed up by running or by being in the sun. At the extremes we might have a wheelbarrow tire or farm tractor tire which is designed to operate at relatively low inflation. Some farm tires are rated at 12 psi. Some Drag Race slicks are also designed for pressure below 24 psi. At the other end we find aircraft tires needing 200 psi or more. For our purposes we can limit our discussion to Passenger tires, Light Truck, Special Trailer and Truck/Bus type tires. Passenger tires generally have recommended inflations in the range of 32 to 36 psi with some Extra Load tires rated at 41psi cold. If you read the sidewall of many passenger tires you will see a maximum inflation pressure stated on the tire. None of these inflations are the hot inflation so don't set or bleed down the inflation when the tire is hot. Many times the tire is stronger than the wheel and I have seen a few examples of wheels failing at a lower pressure than the tire when we put tires to a test of over inflation and head toward 100 psi+. LT and ST tires have a number of different Load Ranges such as "C", "D", "E" and some even go to "LR-F"
The actual psi rating for each load range is not the same for all size tires so you must consult the Load & Inflation chart for your specific size tire. The cold inflation is also molded on the tire sidewall. In general you will see inflations range from mid 40's to 80 psi with the LR-F somewhat higher. As with Passenger tires usually the tire is stronger than the wheel but the inflations are still "cold" not hot inflations. Truck/Bus have higher Load Range and accordingly higher inflations with some at 120 psi range. The one constant SAFETY WARNING is to not set the cold inflation higher than the rated inflation for your specific tire and Load Range but also do not bleed down Hot tires. Tire Engineers know that tires will heat up and we test our tires at highway speed and above when the tire is fully loaded and design the tires to handle the hot inflation. Over-inflation tires make for spectacular explosions. A quick search on YouTube shows a number of examples . Sometimes it is the wheel that fails. In general we see that new tires are capable of handling from 200% to 700% of the cold inflation molded on the tire sidewall when we do a burst test in the lab. With that large of a range there is no single number I can provide. The other thing to remember is that internal structural damage from pot-holes and curbs and road trash as well as simple age can reduce the maximum strength capability of a tire so this compounds the problem of providing a maximum safe cold inflation other than that molded on the tire. Do not exceed the maximum inflation identified on the tire or wheel. Confirm the max load on each tire will never exceed the load capability for your "set" cold inflation per the published tables. If unsure, let a professional tire service person mount and inflate your tires on the wheels. First off if you have a towable RV and your tow vehicle only has four tires you can go get a cup of coffee as this post doesn't apply to you. However, the information here can still be important to know and pass on if you ever happen to be sitting around a campfire and hear someone talking about replacing a failed dual tire. Now lets be sure everyone understands what is meant by "Dual" application vs "Tandem". Tandem means one following or behind the other. Most trailers have either two or three axles in "tandem" and each axle has just two tires on it. This utility trailer has tandem axles. Dual means two tires side by side on the same end of an axle. Most Class-C and Class-A RVs have Dual tires in the rear drive position. A drive axle with dual tires has four tires on it. 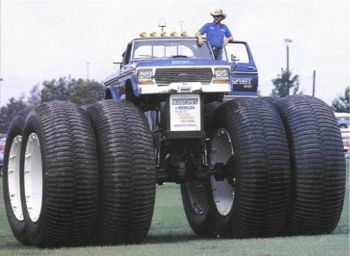 This version of "Bigfoot" has dual tires on each axle. Ok we have definitions behind us. This post will address the proper way to match a pair of tires for dual application. This is very important, as mismatched duals can result in overloading and in extreme cases could lead to tire failure. If you are buying new tires you should find that all the tires are almost identical in OD when first inflated. If you were to accurately measure the tires after a few hundred miles use you would find that the tires have "grown" or stretched out a bit as they were heat cycled, but again the tires would be very similar in dimensions. If you were going to try and measure the OD of a tire you would also learn that it takes special tools to get a direct measurement. The best way to measure how big a tire is is to measure the circumference. You can do this with a standard tape measure. You don't even need to calculate OD from the measured circumference as I will give you the guidelines based on circumference. You just need to be sure you keep the tape at the center of the tire. Here I have affixed one end of a standard tape measure to the center of an inflated tire using masking tape. I next carefully roll the tire around, keeping the tape taught and in the center. When the tape comes around I can get a fairly accurate measurement of the circumference. In this example I didn't use the end of the tape as the tang doesn't lay flat, so using the 3" mark I see 95" for an OC of 92.0 inches. Now you should match tires +/- 3/4" of circumference in dual application. If placing new tires in dual application you do not need to do this measurement but if trying to match used tires or a new tire with a used tire this matching is important. If you do not match the tires the larger tire will be forced to carry an increased load and in extreme cases can result in failure. Can I mix different brands of tires? Do I need to replace all the tires at the same time or can I just buy one to replace the damaged tire or just a pair for the front axle? Do I have to keep the same brand or size or design tire or can I make a change? Lets separate RVs into two categories. Motorized units such as Class-A, B or C and Towables. Towables normally have one, two or three axles and I believe that baring some mechanical problem such as bent or out-of-alignment axle or having had a puncture you will probably be able to replace two at a time so you can spread out the cost for new tires over a couple of seasons. You should replace both tires on an axle with identical size, brand and design as if you mix tires you will probably end up with the tires fighting each other which can cause irregular wear in extreme cases. With four or six tires to worry about there is an increased probability for one to suffer a puncture before the rest of the tires wear out or "age out", so there are advantages to keeping all your tires, including the spare identical. That way if you need to replace just one tire you can use your spare and still end up with the same size, brand and design tire on each axle. If you do change brand, size or design on your trailer and then suffer a failure you may want to purchase two tires to keep all tires on that axle identical. If you take this route I would suggest keeping the spare that matches most of the tires on the ground. A good bit of news for owners of towables. Since you don't have tires mounted in a "dual" position (dual means two tires on the same end on an axle) you do not have to worry about OD matching. With the shorter life of tires on towables it will definitely help with your budget if you plan and do rolling change of say one axle per year rather than all 4 or 6 tires at one time. I would also put the tires with the deepest tread depth toward the rear as rears are more prone to puncture and heavier tread will lower the potential for puncture. an unsafe condition. While you can have one type tire on the front and a different type on the drive and even a third type on the tag axle you should NEVER mix tires on an axle. Previously I have discussed the advantages of confirming availability of tires that are identical to what you are using or you should strongly consider carrying a spare if you have a unique size or brand. It is also critical that when replacing one tire of a pair of duals that both are within 3/4" circumference. If more different in actual measured size one tire will be forced to carry a greater portion of the load from that end of the axle and by now you should know that increased load can contribute to hotter running and in extreme cases. Bottom Line Yes you can change tire Brand or Size or Type but I strongly suggest you do your research in the comfort of your home or at a campground rather than on the side of the Interstate and on the phone with the tire service company. BUT if you change tires you need to be aware of the potential for different and possibly unbalanced handling on motorized RV if you make a change, and the smaller (lighter) the RV the more pronounced this performance difference can be. Having a TPMS is a good investment as it can warn you if you get a puncture and you may be able to stop soon enough that you do not damage the tire beyond repair-ability. Lets think about our favorite topic for a few moments. Some people believe that tire blowouts happen for no apparent reason. 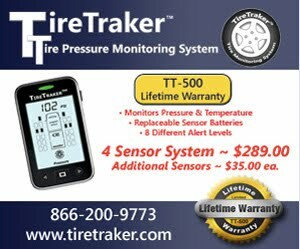 Others are convinced that even with TPMS you will not get any warning before there is a catastrophic failure. Well while watching a re-run of the TV show Mythbusters the other day, I saw a perfect example of just how difficult it is to simply make a properly loaded & inflated tire blow out. For those that haven't seen the show, you should know that the "hosts" are two special effects experts who really enjoy blowing things up or creating some other dramatic footage for TV or movies. In this particular episode, which originally aired June 6 , 2007, they set out to make a truck tire explode and hit a dummy to confirm or bust the myth that exploding truck tires can kill. Just one minor problem... They could not make the tire blow out. They designed a rig that would allow them to run a lightly loaded truck tire at highway speed. First they shot the spinning tire with a .12 gauge shotgun using a large deer slug. They hit the sidewall of the spinning tire as intended but they got a "pissss" of leaking air but no explosion. Next they cut most of the sidewall into the steel body ply then using an industrial torpedo heater they raised the temperature of the tire. They also lowered the pressure to only 30 psi. Still no sudden failure. After watching the test I noted that they were supporting the truck tire with a heavy fork lift so the sidewall was not deflecting as would happen in a real world condition of only 30 psi while fully loaded. You can see the large red heater in this shot. 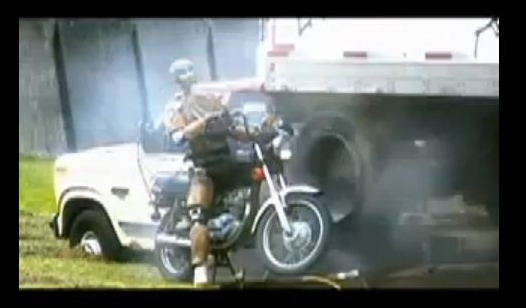 The dummy was their test subject that they originally wanted to hit when the tire blew out. Note the lack of sidewall deflection. 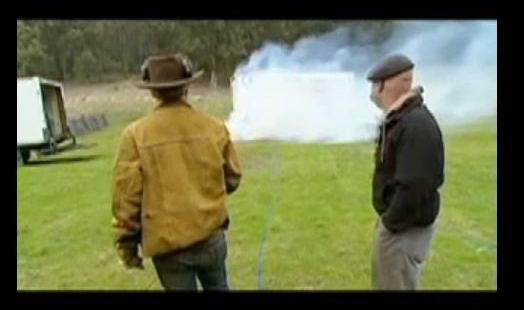 This was why the Mythbusters failed to achieve their goal of having the tire explode. This set of conditions also was not enough, so after bursting the sidewall by over pressurizing the tire they again spun it up and finally were able to make the tire, that was already severely damaged, come apart. Here you can see the results of all their efforts. but you can still see that the truck was suspended so the tire was not flexing as it would in real life. Bottom Line Even when intenionally damaged this video shows how difficult it is to fail or blowout a tire if you do not have the sidewall fold and flex as it would when run extremely under-inflated. To me this supports my position that tires simply do not "blowout" when properly loaded and inflated. If you have a TPMS you would be warned of punctures or small cuts that allow air to leak out over a period of a couple of minutes. This warning should be enough to allow you to safely pull off the road before there is damage to the RV or there is a loss of vehicle control. The full episode is available through Netflix or Amazon. The Youtube version I found however does not show the details of their failure to make the tire fail on command.